The first Christians observed with great devotion the days of our Lord's passion and resurrection, and it became the custom of the Church to prepare for them by a season of penitence and fasting. This season of Lent provided a time in which converts to the faith were prepared for Holy Baptism. It was also a time when those who, because of notorious sins, had been separated from the body of the faithful were reconciled by penitence, forgiveness, and restored to the fellowship of the Church. Thereby, the whole congregation was put in mind of the message of pardon and absolution set forth in the Gospel of our Savior, and of the need which all Christians continually have to renew their repentance and faith. reading and mediating on God's holy Word. 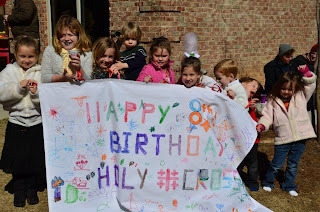 Holy Cross - Eight Years! 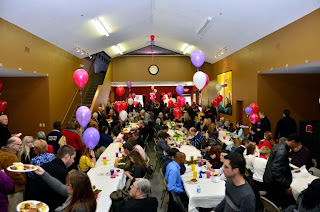 February 8th was the eighth anniversary of our first service at Holy Cross Anglican Church, Loganville, GA. We had a wonderful overflowing combined worship service remembering what the Lord has done for us in previous years, celebration His work in 2011, and looking forward to 2012. After the service we had a brief meeting followed by lunch on the grounds. Great day in our church! Great fellowship! Incredible worship!!! Thank you Lord for the great things you have done. Reading about Lorenzo Dow (see previous posts) has been a fun and intriguing endeavor. Here is a few more stories about the famous itinerant evangelist of whom I had never heard. 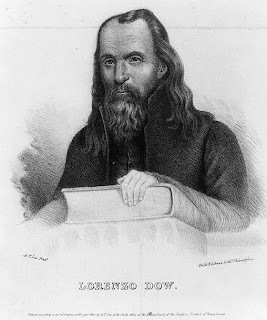 Nothing intimidated Lorenzo Dow; he continued to preach Methodist doctrine even though the Methodist Church would have nothing to do with him. Because the churches were closed to him, Lorenzo Dow started preaching in town halls, farmers' barns, and even in open fields. He would preach any place where he could assemble a crowd. He preached to Methodists, Baptists, Quakers, Catholics, and atheists alike. He liked to appear unexpectedly at public events, announcing in a loud voice that exactly one year from today, Lorenzo Dow would preach on this spot. He never disappointed his audiences; he always appeared exactly 365 days later at the appointed place, usually met by huge crowds. It is recorded that Lorenzo Dow often preached before open-air assemblies of 10,000 people or more and held the audiences spellbound. That must have been some feat before the invention of public address systems! He preached regardless of the weather: oppressive heat, violent thunderstorms, and blizzards never stopped him. HOW HE RAISED THE DEVIL.... Once Lorenzo Dow was traveling in the northern part of Vermont when he got caught in a terrible snowstorm. He managed to make his way to the only light he could see. After repeated knocking at the door of the humble log house, a woman opened it. He asked if he could stay the night. She told Dow her husband was not home, and she could not take in a stranger. But he pleaded with her, and she reluctantly let him in. He immediately went to bed, without removing his clothing, in a corner of the room separated from the main living quarters only by a rude partition with many cracks in it. After he had slept for just a short time, the preacher was awakened by the sounds of giggling and whispering from the main room. Peering through a crack in the partition, he saw that his hostess was entertaining a man who apparently was not her husband! No sooner had he taken this in, when Dow heard a man's drunken voice shouting and cursing outside the front door, demanding to be let in. Before admitting her husband (for it was he, returned unexpectedly), the wife motioned her lover to hide beside the fireplace in the barrel of tow, a coarse flax ready for spinning. Once inside, the suspicious husband quickly sensed that his wife had not been alone, and demanded to know who else was in the house. When the quick-witted wife told him about the Reverend Dow, sleeping in the corner, he was not satisfied. After all, he was not so drunk that he would take his wife's word for the identity of the houseguest. "Well, now," roared the husband, "I hear tell that parson Dow can raise the devil. I think I'd like to see him do it -- right here and now." Before the wife could shut up her boisterous husband, he had pulled the famous preacher from his bed, where he had pretended to be sound asleep. "Rev'rend," he bellowed, "I want you to raise the devil. I won't take 'no' for an answer." Seeing that he would have to perform, Lorenzo finally said, "Well, if you insist, I will do it, but when he comes, it will be in a flaming fire. You must open the door wide so he will have plenty of room." The husband opened the door. Then, taking a burning coal from the fire with the tongs, Dow dropped it into the tow cask. Instantly the oily contents burst into flame. Howling in pain from the fire which engulfed him, the flaming figure of the naked man hidden in the barrel leaped out onto the floor and, just as quickly, darted out the open door, trailing ashes and smoke. He ran down the snowy road as if pursued by demons. It is said that the sight of all this not only sobered the drunken husband immediately, but permanently cured his taste for booze. And that was certainly one of the Rev. Dow's major miracles! ONE LAST STORY...Lorenzo Dow once met a man as he was riding along a solitary road to fulfill an appointment, and said to him -- Friend, have you ever prayed? No. How much will you take to never to pray hereafter? One dollar. Dow paid it over, and rode on. The man put the money in his pocket, and passed on, thinking. The more he thought, the worse he felt. There, said he, I have sold my soul for one dollar! It must be that I have met the devil! Nobody else would tempt me so. With all my soul I must repent, or be damned forever! I have been finding some amazing stories about Lorenzo Dow (see previous blog), the fiery evangelist who traveled by foot or horse proclaiming the Good News of Jesus Christ and attempting to rescue people from an eternity in hell. There are many stories about Dow showing up some place unannounced and declaring that he would show up exactly one year later to the day to preach. Exactly one year later, he would show up from nowhere to preach. On one such occasion he showed up by climbing through a window, preaching his sermon, and then running to the window, jumping out onto his horse, and then galloping out of town. Around 1820, an evangelist named Lorenzo Dow (1777-1834) came to Jacksonborough, and his overnight visit there has grown into one of Georgia's most enduring legends. 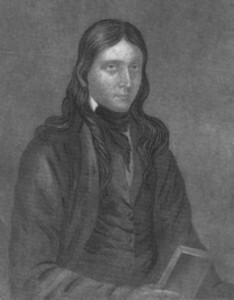 Born in Coventry, Connecticut, he felt the call to preach at the age of 18. Dow was an eccentric character in look and chosen method of evangelism. The tall, slightly humpbacked, preacher had long hair and a beard. Early in his ministry, he walked from town to town passing out handbills in the day and preaching that night, usually staying no more than a night or two in a single town. He referred to himself as "Crazy Dow," and records in his own writings that he was often an object of scorn and abuse in the towns he traveled to. By the early 1800's however, Dow gained a reputation as one of the country's leading evangelists. He preached to the Georgia General Assembly in the then capital of Louisville and to a gathering of five thousand elsewhere in Georgia. In Jacksonborough, the town's reception was not so inviting. At that time, Jacksonborough was a rough place known for the hard drinking and fighting of many of its residents. The oft repeated saying from George White's 1849 book Statistics of the State of Georgia was, "The place had formerly a very bad character. It was reported, that in the mornings after drunken frolics and fights, you could see children picking up eyeballs in tea saucers." 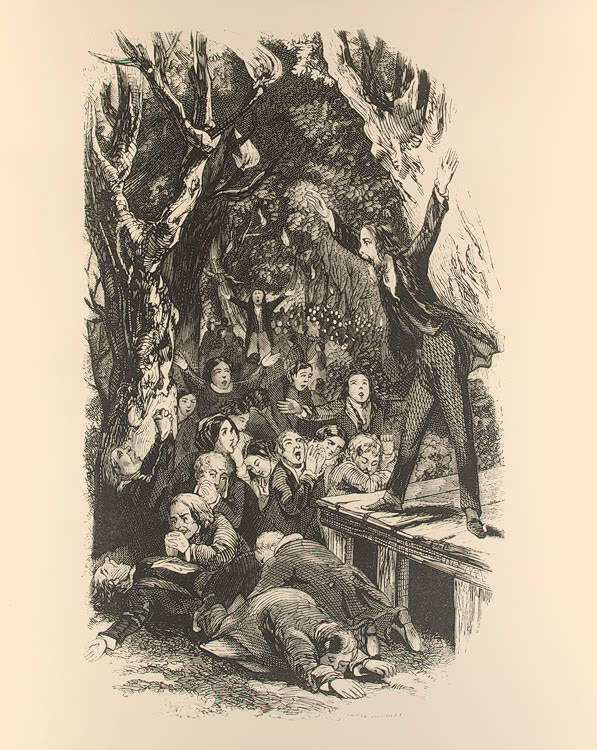 Dow's fire and brimstone sermon at the Methodist Church that night was interrupted by a group that had gathered to harass the evangelist. The service was broken up by the group of "rowdies." Undaunted, Dow followed the group that harassed him as they went into a whiskey store. He was covered with the stink of rotten eggs, but unbowed. Tradition has it that the fiery preacher snatched up an iron tool and broke open a barrel of whiskey, dumping its contents across the floor. The crowd would have seriously injured or killed Dow if fellow Methodist and Mason Seaborn Goodall had not rescued him, taking Dow home for the night. The crowd was not appeased and a mob gathered at the Goodall home the following day with a supply of eggs and tomatoes. Dow walked out of town under a barrage of fruit and eggs, stopping at the Beaver Dam Creek Bridge. Dow quite literally shook the dust of Jacksonborough off his feet as the disciples of Jesus were instructed to do in the New Testament. As he did so he cursed all of Jacksonborough save the Goodall home. Thirty years later, all that was left of the town was the Goodall's home and the story of the curse. The Goodall home had fallen into disrepair by the mid-1960s when the Brier Creek Chapter of the Daughters of the American Revolution took possession of the house. The group raised $40,000 and renovated the house. Today the old Goodall home still stands in good repair along an otherwise abandoned dirt road while all other signs of the once bustling town are long gone. A note to the reader who has this story reproduced here without the benefit of the remainder of the tour in the book. Jacksonborough is indeed gone without a trace save the Goodall home today. It is just off U.S. 301 several miles north of Sylvania, Georgia. This past week I was driving on a road, out in the middle of nowhere, just north of Monticello, Georgia, and passed a big rock on the side of the road. My mother, who spent the last couple of years of her life in Monticello, had told me the rock was called Preacher's Rock by the locals. I have driven by that rock for over 20 YEARS, and this week I finally stopped to read the plaque on the rock. As you can see, it is actually called Dow's Pulpit, named for an itinerant evangelist, Lorenzo Dow. The plaque was put here in 1938 by the Daughter's of the American Revolution in memory of Lorenzo Dow preaching at this spot 135 years earlier. WHO WAS LORENZO DOW? my mind wondered. Never heard of him. Well, in today's "Internet Google World" I learned a lot of things of which I think most of them are true! First, there was indeed a man named Lorenzo Dow. He was born on October 16, 1777 in Coventry, Connecticut. Secondly, he eventually came to the Lord and went to a Methodist College and when he tried to be become a Methodist minister, they told him no because of his eccentric methods of evangelism. He became an evangelist (never referring to himself as "reverend") and traveled by foot or horseback all over the nation proclaiming Jesus Christ as the way of Salvation. In 1803 he made his way to Jasper County, GA just north of Madison and preached on this rock. Although he was "crazy" (his words) in his approach and was run out of many towns for preaching the Gospel of Jesus, his name became the most popular name to name your son in America -- Lorenzo Dow (Lorenzo Dow Jones, for example). His autobiography became the most purchased book in America (not sure of the year) behind the Bible. I had the privilege to attend a banquet tonight honoring two of the founding members of our congregation. Sandra and Clyde Strickland were named by the Gwinnett County, GA Chamber of Commerce as the Citizens of the Year for Gwinnett Country. Considering Gwinnett County has over 700,000 people who live here and more who come to work here, this is an incredible honor. They have given of themselves in Christian witness sharing their faith in the public arena by word and deed alike. They have shared of their time, talent, and treasure to make Gwinnett County a better and caring place in which to live. In a time in which so many Christians are living for themselves in the Name of Jesus, it is so refreshing to know and witness two servants of the King doing it for Him and for "the other."